(Newser) – Whales need to surface in order to breathe, and the narwhal is no different. Every four to six minutes, the Arctic whale—including males with a long tooth resembling a horn—must emerge from the depths of Baffin Bay between Baffin Island and Greenland, where 80% of all narwhals winter, and find tiny openings in the ice, reports the New York Times. 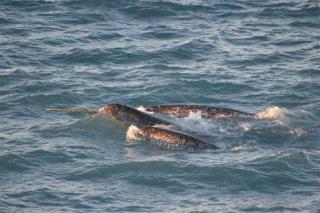 "You don’t see open water for miles and miles and suddenly there’s a small crack, and you’ll see narwhals in it," says the lead author of a new PLOS study. "I’ve always wondered how do these animals navigate under that, and how do they find these small openings to breathe?" The answer, it turns out, is remarkable. Narwhals use the most directional sonar of any species, sending up to 1,000 "clicks of sound" per second through their heads, then directing the clicks into a beam, focusing on prey like fish and squid in the Arctic depths, or sections of open water amid an icy surface. Arden. I like your diversity of stories. Keep up the good work.